The summer of 1969 had been really hot and sweaty nothing much was happening around the Bronx, until my rock band, Group Power found out in early August that there was a super concert planned. 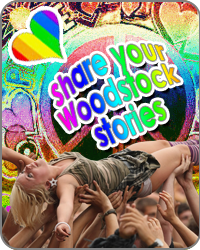 Woodstock they called it and everyone would be there. The Rolling Stones, The Who, Santana and Jimi Hendrix. More were being added daily. It was to be somewhere in upstate NY, perfect right in my home state wouldn’t have to travel far. Tickets if I remember correctly were about $15. I didn’t have it ready in time, so our group leader bought all 4 tickets for us. We were extremely excited because we were all going, now was the hard part to convince out parents to let us go for three days and two nights. Finally after a lot of badgering that we were all guys and would be alright my parents relented. That day I prepared 2 doz boiled eggs for the trip to have portable food and a 5 Lb bag of popcorn (really huge) we had from working at the movie theaters changing marquee’s. That Friday in the late afternoon after work we loaded up a U-Haul van from the Bronx and started on our journey to Woodstock.